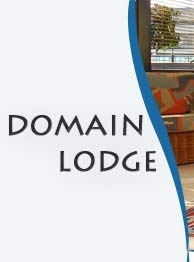 Domain Lodge is a smoke-free environment providing a range of accommodation options to our guests from studio and family suites to fully self-contained apartments. All are equipped with either double or twin bedrooms, and each has an ensuite along with Sky TV, telephone, radio, refrigerator and tea/coffee-making facilities. Rates are per room for a maximum of two persons with either queen-size or twin single beds. Every room has an ensuite and most rooms have access to or a view over the garden areas. Rates are per suite for a maximum of four persons with queen-size or twin single beds and a double sofa bed. Every room has an ensuite and most rooms have access to or a view over the garden areas. Rates are per apartment for a maximum of six persons with queen-size and twin single beds available. Every apartment has kitchen, ensuite, dining and lounge areas and a double sofa bed. Most have balconies with a view over the garden. The room rates range from NZ$149 - $239 (GST incl.) per night for one person. Additional guests will be charged $10 each per day (GST incl.). There are no weekend or holiday surcharges. Children 0-12 years will be charged at $10 per child per day. All suites and apartments are supplied with fridge, tea and coffee-making facilities and Sky TV. A choice of payment methods on departure includes Visa, MasterCard, Bankcard, AMEX, EFTPOS, cash or a pre-arranged company charge facility. Please note we do not accept cheques. Credit card details are required at time of booking to guarantee your reservation. Should you fail to arrive and have not given 24 hours notice of cancellation, your card will be processed for the value of one night's accommodation. The Hall, seats up to 75 in theatre configuration or can be set up with tables and chairs in whatever configuration required. The adjacent kitchen with oven, microwave, fridge and dishwasher allows for externally catered food to be served. Cost is $415 per day (over half a day), or $210 for up to half a day (subject to change). The Support Room seats up to 30 in theatre style. Can be configured with tables and chairs as required. $225 per day (over half a day), or $125 for up to half a day (subject to change).